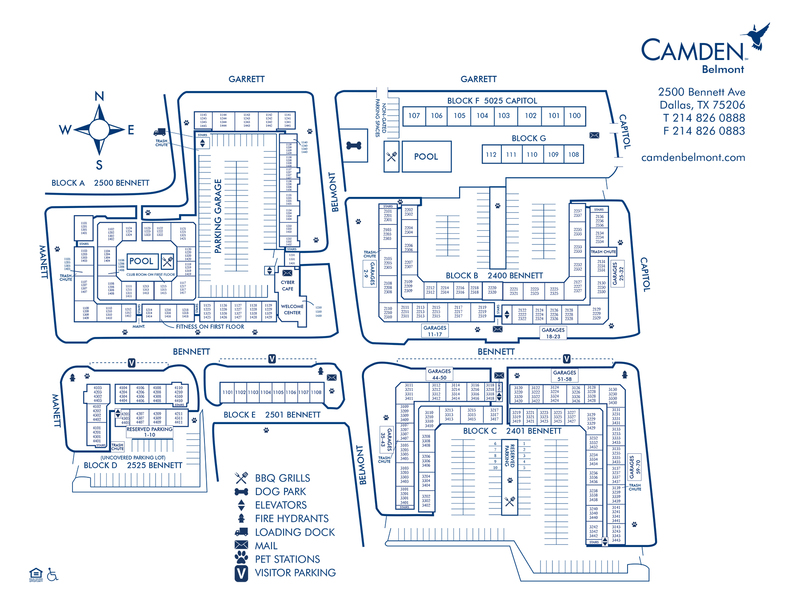 Camden Belmont features one, two and three bedroom apartments and townhomes centrally located in the vibrant Knox-Henderson district near Greenville Avenue in Dallas. The open-concept apartment homes have chef-inspired kitchens with granite or quartz countertops, glass top stoves, dark cabinetry with brushed nickel finishes, and pull-down sprayer faucets. Luxury features like custom closet organization systems and designer pendant and track lighting are included alongside conveniences like full-size washer/dryer, USB outlets, and kitchen pantries. Choose from concrete, hardwood-style and carpet flooring combinations. And, many floor plans have stand-up showers, private patios, and built-in bookshelves or desks. Enjoy direct access parking in all apartment homes or attached garages in townhome floor plans. Want to take a look for yourself? Take a virtual tour here! The luxury experience continues outside of each apartment door with amenities and services that rival top resorts. Cancel that gym membership and work out in the 2000 sq. ft. fitness center complete with TRX suspension training and WellBeats, on-demand virtual training. Relax at one of the two beautiful pools with entertaining, lounging and grilling areas. The indoor/outdoor lounge is the perfect spot to host friends complete with TVs, bar and dining space, and an executive kitchen fully-equipped for all your entertaining needs. Or grab a cup of gourmet coffee in the Cyber Café, which also serves as a quiet work environment with computers and a printer/scanner/fax available 24-hours a day. Camden Belmont is also a pet-friendly community. Your furry friend will love the nearby dog park as well as dozens of pet-friendly bars and restaurants within walking distance. Take advantage of the countless restaurants, nightlife and shopping within walking distance from your apartment home. Then if you take a short drive, SMU, Uptown and Deep Ellum are all less than 4 miles from your apartment. With convenient access to Highway 75, Interstate 45 and the Woodall Rodgers Freeway, living at Camden Belmont will put you at the center of the Dallas metro. Residents receive a technology package included in the total monthly rent with a savings of up to 50% off retail. This money saving package includes high-speed internet with speeds up to 100 Mbps. This includes over 360 digital video channels and 160 HD channels through AT&T U-verse U200. Use the AT&T U-verse app on your smartphone or tablet to access your digital video anywhere! Plus, this package includes a total home DVR that lets you record up to 4 shows at once. Camden Belmont offers the best in urban living - spacious apartments and townhomes coupled with breathtaking views of downtown Dallas. At Camden Belmont, you can have it all. Call today to schedule a tour! Parking is available on a first-come, first-served basis. We offer reserved spaces and garages for rent. Please contact the office for pricing. Each of our townhomes has an attached 2-car garage. Many of our apartment homes are attached to a parking garage. There are 3 gated surface lots with open parking for residents.